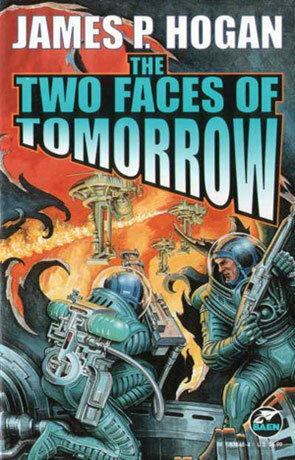 The Two Faces of Tomorrow is a science fiction novel by James P Hogan. Hogan starts of well enough in this book, where he tries to tackle the quite interesting question of whether an artificial intelligence could be a threat to mankind or not. The premis is that anything worthy of the label intelligence will probably be self aware and self awareness will probably be followed by a survival instinct. A survival instinct could easily be followed by an yearnings toward removing possible threats – like humans and their busy fingers. Which of two possible tomorrows will humanity face. One where we walk side by side with machine intelligence as our companions or one where we decide that we dare not try that path and we decide to talk alone. Well, actually there's a third possibility, namely that machine intelligence take over and kicks our collective asses. Like I said, the premises is interesting enough, but Hogan manages to make the story quite predictable and to centre it around the fight against the Machine-Intelligence-Gone-Bad so fast, that the original question is left unanswered and irrelevant to the situation at hand. The fight against the machine intelligence is interesting enough, but the humans amazement at the machine's ability to put two and two together and get four quickly becomes rather annoying. I've attacked Hogan for his characters in other reviews, but the characters in this story are a pleasant surprise. They have a bit more depth than you would normally expect from Hogan. All in all an okay story if you take care not to get your hope up too high, during the rather interesting first part.